It was time for a new tilapia recipe. Between a tilapia dish Bryan makes using lemon juice and old bay (I’ll share that one sometime- it tastes like crab ultimately!) 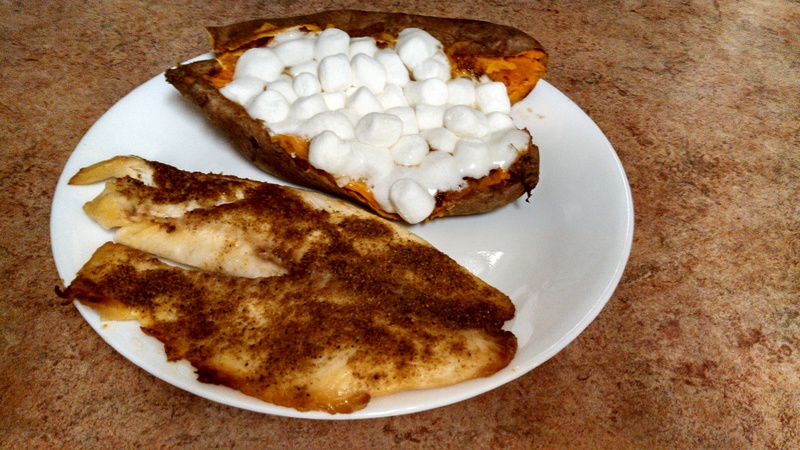 and my tried and true tilapia recipes, I was in search of a recipe using some other spices. This Cooking Light recipe meets the mark and could not be easier to prepare. 3 steps to delicious, my friends! The cayenne does give a little kick so be prepared particularly those of you sensitive to a little heat. Per other recipes you’ve seen from me, I guess it is no secret how much I love a sweet potato with marshmallows atop, huh? It went with the fish quite well if I do say so myself. Preheat broiler. If you don’t have a broiler, preheat oven to 325 degrees. Rub oil evenly over fish. 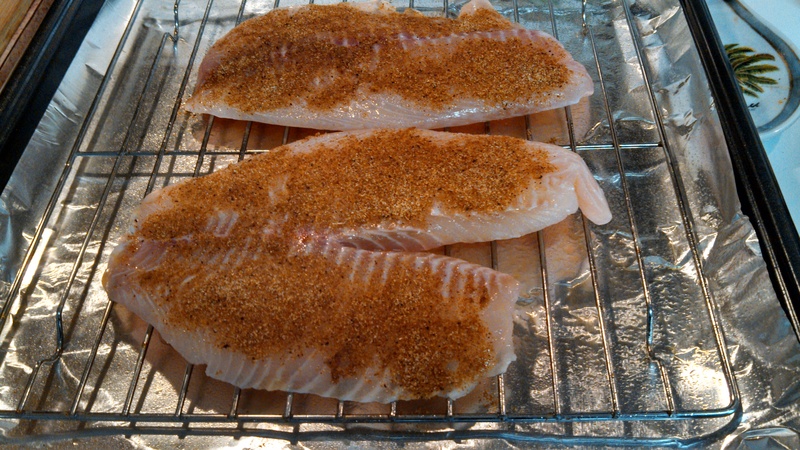 Combine cumin, salt, garlic powder, and peppers; sprinkle over fish. Arrange fish on a broiler pan coated with cooking spray. Broil 5 minutes or until fish flakes easily when tested with a fork or desired degree of doneness. Alternatively, you can bake the tilapia for around 10 minutes at 325 degrees.